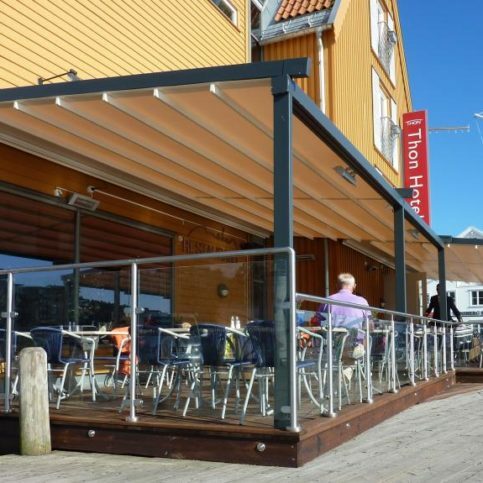 Would Your Home or Business Benefit From Awnings for Temperature Control and Visual Appeal? Awnings may be the answer to your exterior decoration needs and indoor temperature control whether you are a homeowner or a business-owner in Hayward, Berkeley, San Leandro, Oakland, Fremont, Alameda, Union City, Pleasanton, Newark and Dublin or other areas of Alameda County. Awnings, also known as overhangs, are usually canvas or other fabric stretched over a light frame and attached to the exterior wall of a home, business or other structure. 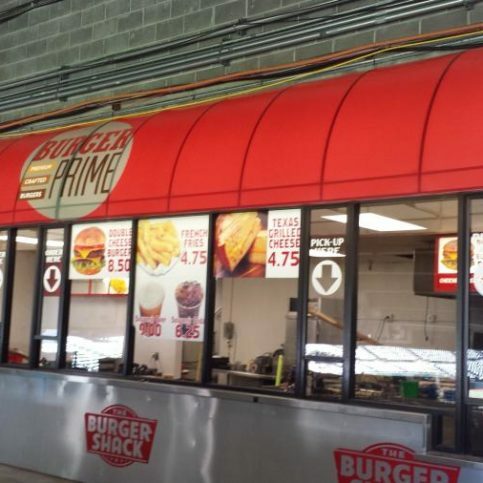 Metal awnings, removable awnings, retractable awnings and freestanding awnings are also available. Regardless of your needs, you will be able to find an awning that makes your home or business more attractive, functional and comfortable. Read on for more information about the options you have in choosing and buying new awnings in Alameda County. 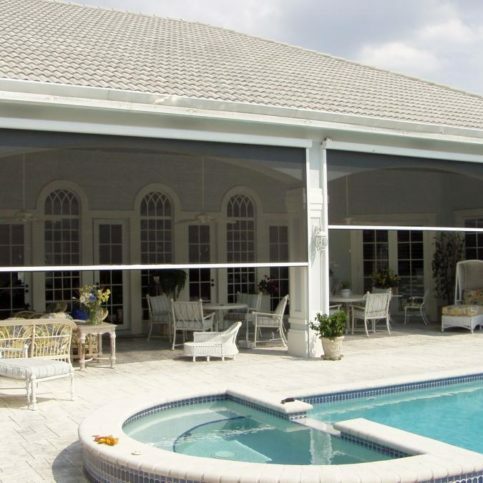 Retractable awnings are popular in Dublin, Newark, Pleasanton, Union City and Alameda, Komandorski Vilage, Livermore, Sunol and Emeryville, and beyond for their ease of use and flexibility. 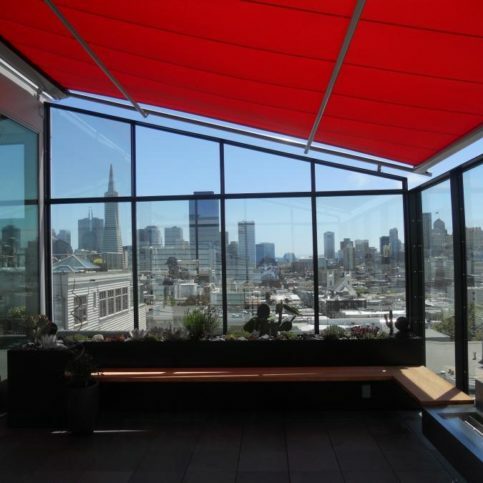 Retractable awnings give you control over how much sun reaches your building or outdoor area. 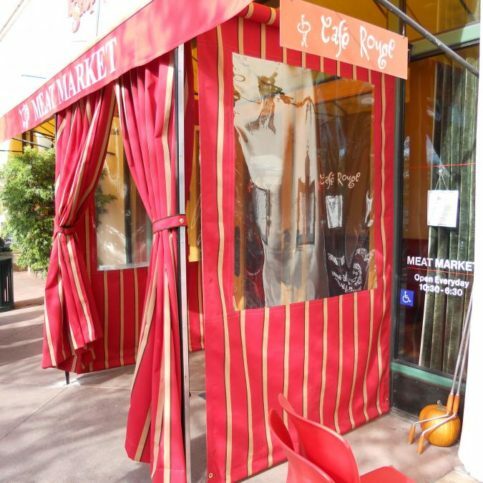 These awnings open easily using mechanical or manual cranks to block hot sun or light sprinkles and rain. 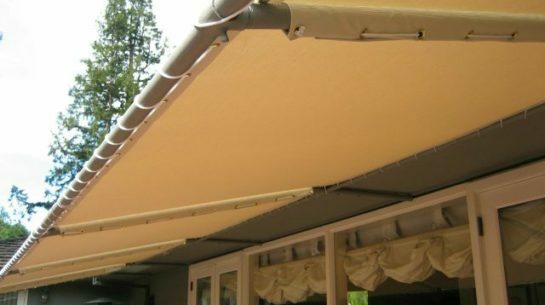 Restaurants in Alameda County and the Bay Area may install awnings to provide comfortable outdoor dining areas for customers; while homeowners can install them on the exterior of their home to lower cooling costs and protect furnishings from fading, or they can install them outdoors to make their deck, patio and poolside area more comfortable. 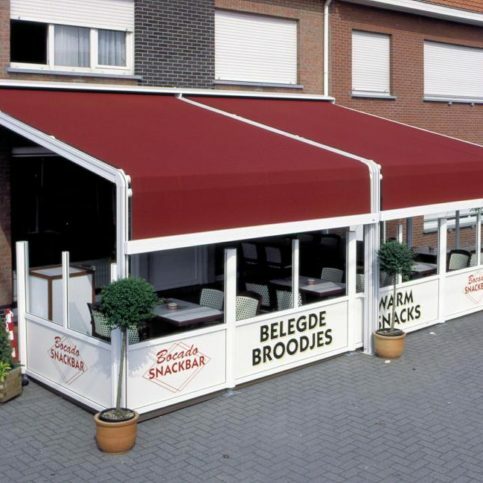 Manual retractable awnings require the user to physically open and close the awning shade. These are often the most affordable awnings in Alameda County, as they are simpler in design and construction than electric models. They also may be easier to adapt to most outdoor areas. Manual awnings usually require the installation of permanent support arms that stabilize the unit, and may allow use in windier conditions. Automatic awnings are also popular in Oakland, San Leandro, Berkeley, Hayward and Fremont and other parts of Alameda County. 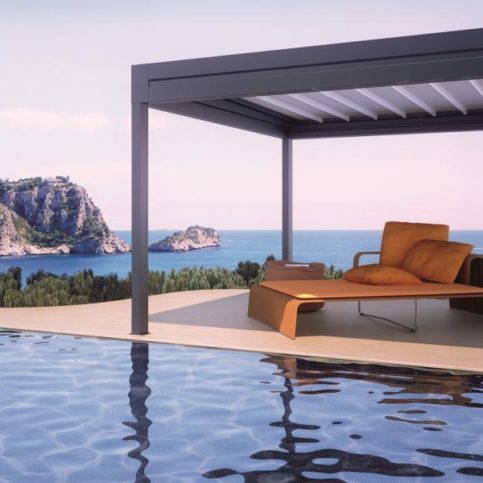 These include retractable awnings that have sensors to monitor for rain, wind and sun. When conditions are right for extension or retraction, these awnings open or close without human interaction. Why Trust Diamond Certified Awning Companies Rated Highest in Quality and Helpful Expertise®? Knowing what you want in your new awnings before you start looking can help you make better decisions when vising Alameda County awning stores. 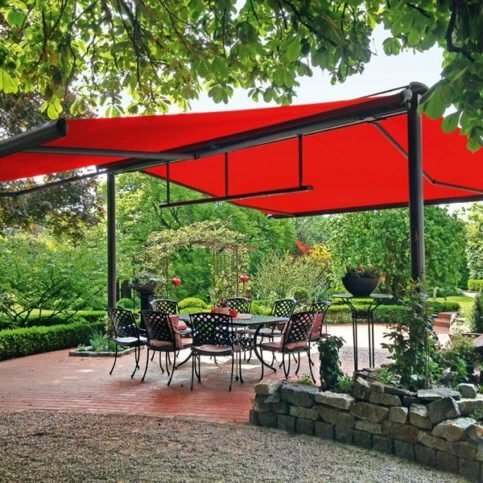 You’ll be more likely to be happy with your new awnings if you have an idea of the type of new awnings you want, how much you’re able to spend, and other details about your sunshade purchase before you look at your awning options in stores in Oakland, Dublin, Fremont, Newark and Hayward or near you. Once you have a good idea of the types of awnings that will best suit your project and the services you will need to complete your awning installation project, and when you have interviewed representatives from a few Alameda County awning companies in person, it’s time to make appointments to visit with awning companies in person. This will give you a good chance to see the awnings available to you and to discuss your project with the Alameda County awning company. It’s best to choose a Diamond Certified awning company because all certified companies have passed an in-depth ratings process that most other companies can’t pass. 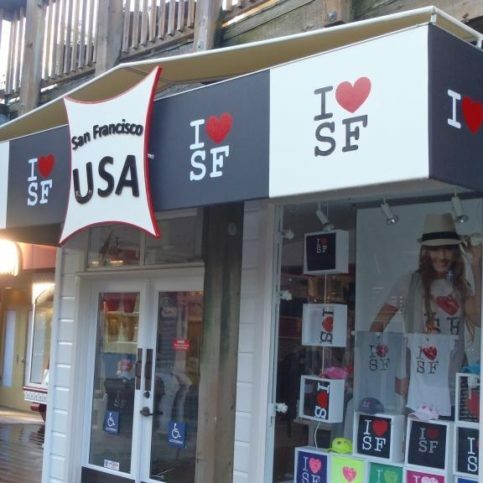 If you want quality from the new awnings you buy in Alameda County and the rest of the Bay Area, you can have confidence choosing a Diamond Certified company. If you can’t find a Diamond Certified awning contractor in Hayward, Berkeley, San Leandro, Oakland, Fremont, Alameda, Union City, Pleasanton, Newark and Dublin or within reach, you’ll have to do some research on your own. If you do, it’s wise to call some references provided by the awning companies you’ve contacted. Keep in mind, though, that references given to you by awning stores in Alameda County and beyond are not equal in value to the large random sample of customers surveyed during the Diamond Certified ratings process. That’s because references given to customers from companies are cherry-picked to include only satisfied clients instead of random names selected from all their customers. Were you satisfied with the new awnings you purchased from and/or had installed by (awning company name) and the service you received from the company? If you hired the Alameda County awning contractors to install your new awnings, did they complete the work on time and as promised? If you live in a rural or smaller area such as Castro Valley Cherryland, Russell City, Piedmont, Livermore and Albany did the awning delivery company or awning installer charge extra to travel to your home? 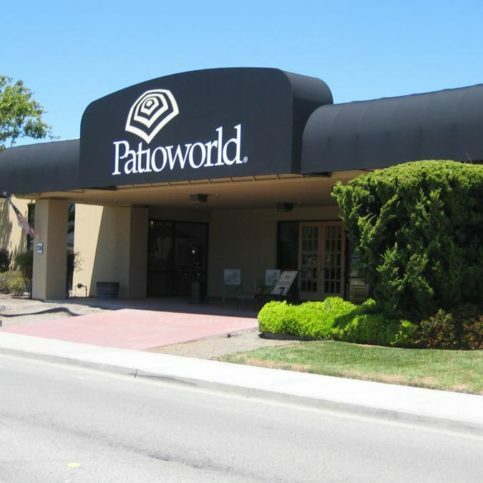 What was the best part about working with this awning company / buying new awnings from this Alameda County awning store? 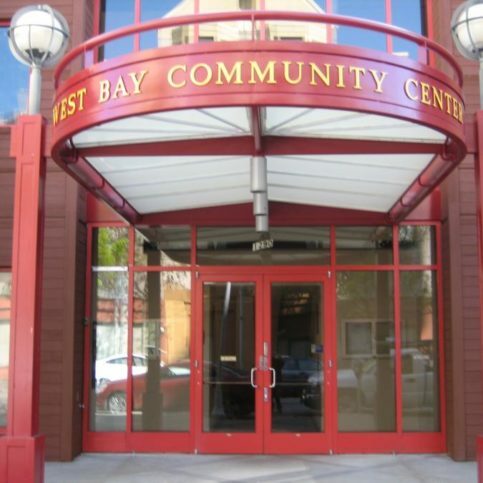 Review your interview notes and consider the following questions before making your final decision on an awning store or awning contractor in Alameda County. Is one of the awning contractors or awning stores in Alameda County able to meet your needs in terms of awning type, awning design, installation and budget for new awnings? 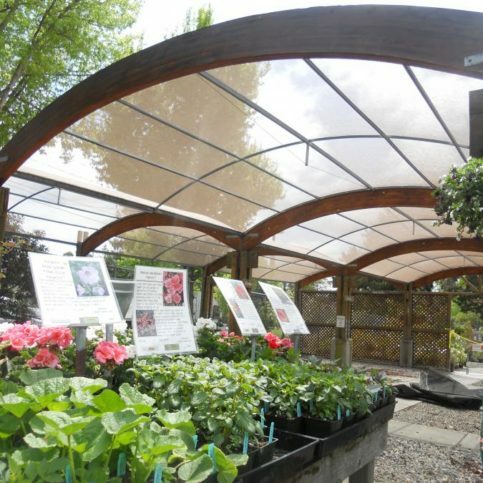 Are the Alameda County awning stores knowledgeable about the best type of awning for your home or business? Can they explain why they’ve recommended certain brands or types of awnings for your home or business (i.e. retractable awnings, automatic awnings, fixed awnings, waterproof awnings, etc.)? 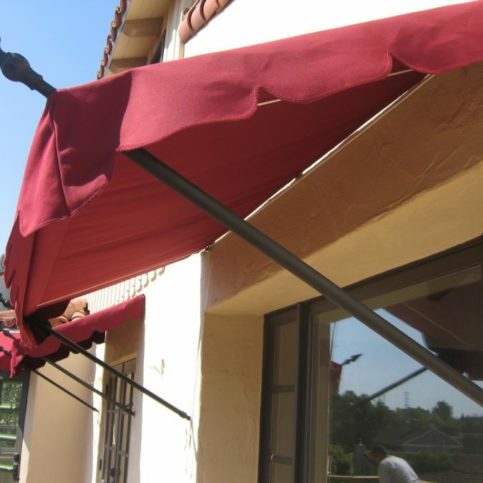 Are the awnings from awning stores in Dublin, Newark, Pleasanton, Union City and Alameda covered by written manufacturer warranties to protect your investment? 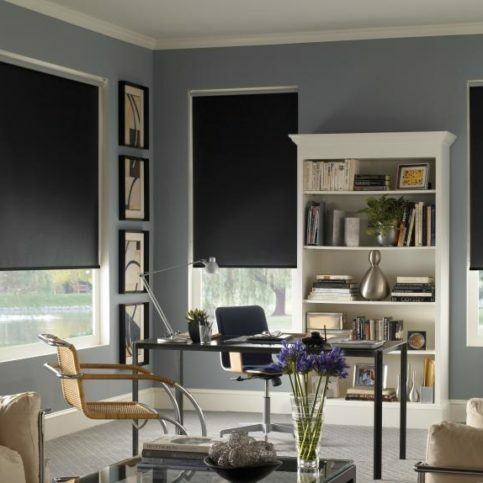 Once you have a good idea of what you’re looking for, you’ll be better equipped to talk with the staff at Alameda County awning stores, including those in Oakland, San Leandro, Berkeley, Hayward and Fremont, San Lorenzo, Mount Eden, Ashland and Emeryville and other areas. Knowing what you need before you start to look will also give you better boundaries so that you don’t end up paying for more than you need or want. You will also have an idea of whether you can install the new awnings yourself, or if you need Alameda County awning installers to do the job for you. Most single awning units, including retractable awnings and motorized awnings, are fairly simple to install yourself. They often come with all of the materials needed for installation and detailed instructions. Some awning companies provide customer support over the phone or online for DIY awning installation. If you are having many window awnings installed on your home or business, are having awnings installed on hard-to-reach areas, or aren’t very handy with do-it-yourself projects, you may want to ask the Alameda County awning stores if they provide installation services or can recommend qualified awning installers to do the job for you. As with any contractor you hire, you’ll want to be sure these installers are licensed, insured and come with good references who can vouch for their past work and customer service. 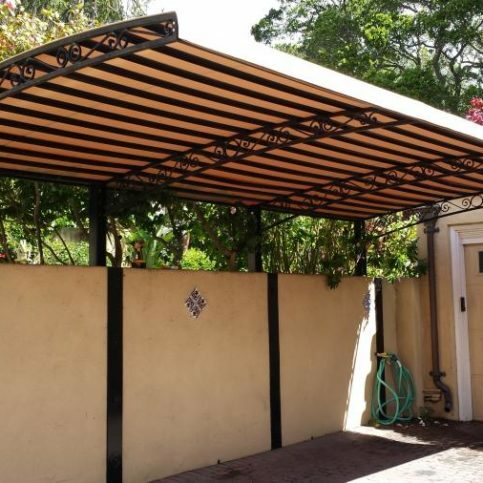 Once you’ve found the Alameda County awning company you want to hire, move forward by ordering the awnings you need or purchasing them at the awning store. Some companies may ask you to sign an estimate and contract, others will only require you to come in and buy the awnings you want off of the rack. If you are having Alameda County awning installers provide installation, however, there are a few things you can do to save time and money. Make room for work trucks. 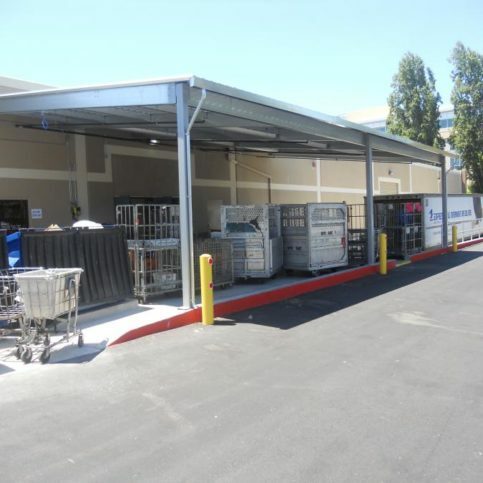 Awning installation work, especially on large homes or commercial buildings in Oakland, Dublin, Fremont, Newark and Hayward or other areas, may require the awning company to drive large work trucks or park large vehicles on site. These vehicles may require larger parking spaces or more clearance than passenger vehicles. Talk with your Alameda County awning service and ask them if you’ll need to make room for their awning installation vehicles. In extreme cases, such as very tall buildings that require scaffolding or bucket trucks, the awning installers may want to walk through the work site with you to identify any clearance issues. Finding and buying the best awnings for your home or business will be easier when you follow the advice above. Surprisingly, it can be an even smoother process when you take a few simple steps to be a good customer when buying new awnings in Alameda County, including those from awning stores in Pleasanton, Berkeley, Union City, San Leandro and Alameda and beyond. Let the Alameda County awning company know what you want from your new retractable awning or fixed awning, the long-term results you’re expecting and specific ways they can satisfy your expectations during the buying and installation process. Before you buy new window awnings in Alameda County, restate your expectations and goals, and reiterate to the awning company representative your understanding of the agreement. Most problems with local retractable awning companies occur because of a breakdown in communication. By being clear about your expectations and theirs, you can avoid most conflicts. If you are hiring an awning contractor in Alameda County to install your new awnings, be sure to return calls promptly to keep the window awning installation on schedule. Why would you want to be a good customer? 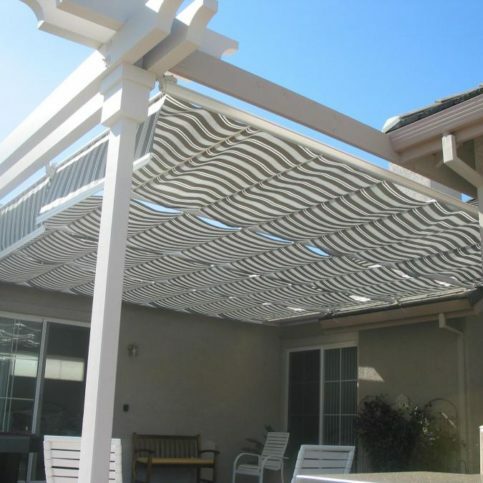 Awning companies in Alameda County appreciate customers who are honest, fair, communicative and easy to work with. The name, physical address and state license number (if installation work was performed) of the Alameda County awning store or awning installation company. Confirm any warranties offered by the awning manufacturers or awning stores in Alameda County, including those in the larger cities of Hayward, Berkeley, San Leandro, Oakland, Fremont, Alameda, Union City, Pleasanton, Newark and Dublin or your area. 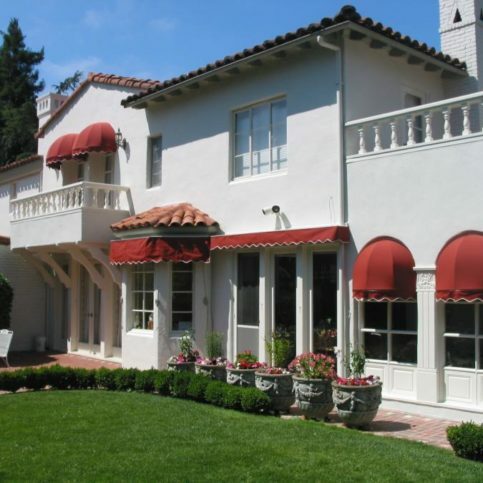 A huge variety of awnings and awning services are available in Alameda County, including Dublin, Newark, Pleasanton, Union City and Alameda and other areas. Shade sails are tightly tensioned fabric swaths that are anchored at the corners and provide shade. Unlike awnings, shade sails are not permanently affixed to the side of a building. 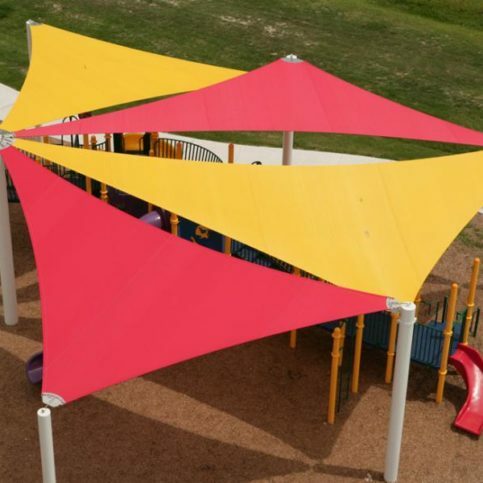 These shade sails come in a wide variety of shapes, sizes and colors, and are often made out of high-density, UV-resistant fabrics. 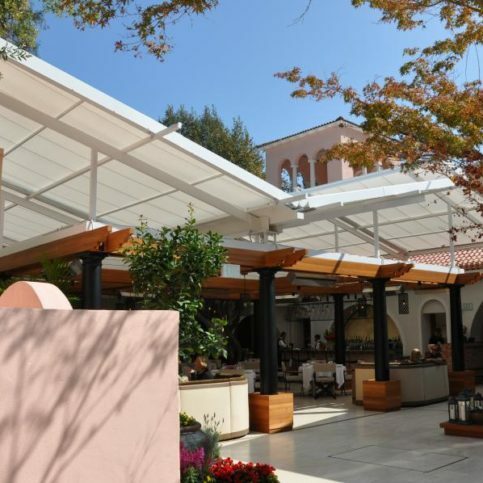 Shade sails can be an inexpensive and visually-pleasing option for homes, businesses and areas that aren’t good fits for traditional awnings and canopies. Patio awnings are retractable or fixed awnings that stretch over a patio or deck area. 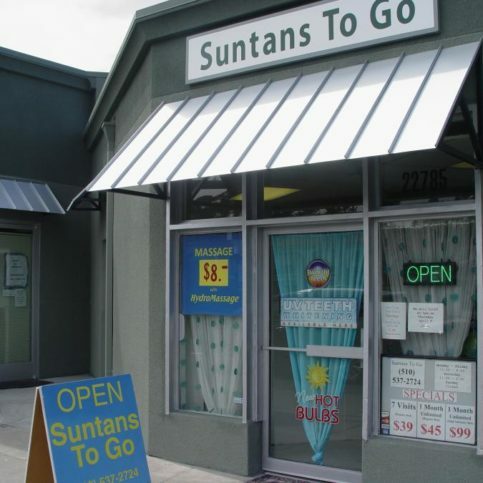 They block direct sun and keep the patio cooler, making for more comfortable outdoor living in Pleasanton, Berkeley, Union City, San Leandro and Alameda and rural areas. 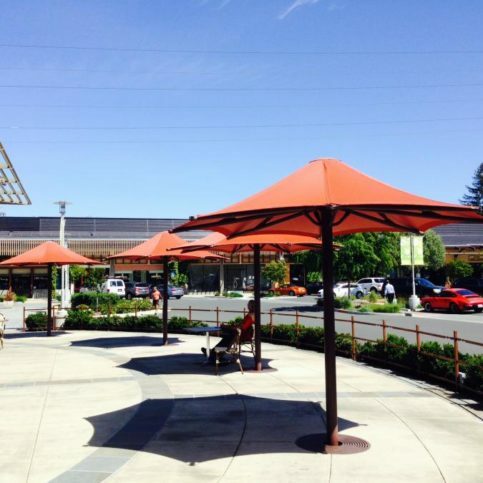 Awnings at businesses in Alameda County may serve dual purposes: blocking sun and providing decoration and even identification. 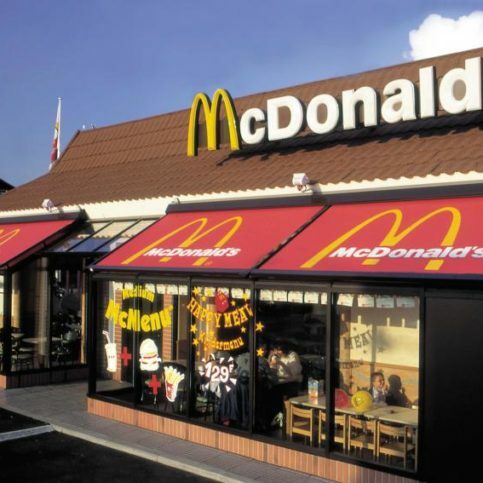 Business awnings can have the business name, address and even advertising slogans or information included on them. Simple awnings can be easy to install, but some awnings require professional installation. Awnings for multi-story buildings, metal awnings, permanent awnings, and homes that require awnings on many windows may be good candidates for professional awning installation services in Alameda County. 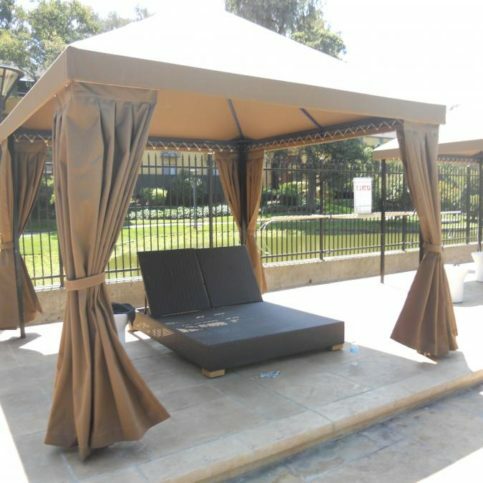 Regardless of what type of awning you’re looking for, or whether you live in Oakland, San Leandro, Berkeley, Hayward and Fremont or another area, there is a manufacturer who can provide it. 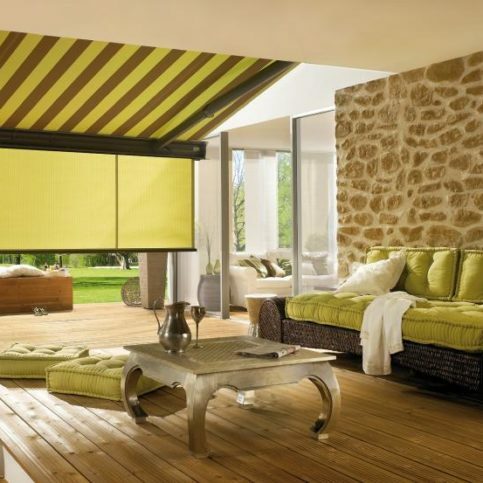 Some of the more well-known awning manufacturers and awning companies are listed below. Obviously each awning and installation site are different, so you’ll want to ask job-specific questions of the awning contractor you’re considering. However, there are some common questions that homeowners and business owners want to know before purchasing a new window awning. Many of the most common questions and answers are listed below for your convenience. A: Diamond Certified helps you purchase new awnings with confidence by offering a list of top rated local companies that have passed the country’s most in-depth rating process. Only local awning manufacturers and awning companies rated Highest in Quality and Helpful Expertise® earn the prestigious Diamond Certified award. Most companies can’t pass the ratings. American Ratings Corporation also monitors every Diamond Certified company with ongoing research and ratings. And your purchase is backed by the Diamond Certified Performance Guarantee, so you’ll feel confident choosing a Diamond Certified awnings company to build, provide and install your awnings. A: Yes, properly positioned awnings can block direct sun rays from shining in windows and glass doors, which can keep your home much cooler on even very hot days. This can save you money on air conditioning and cooling.